As promised last week, we are adding some new prizes now that we are over half way to our goal. Probably the most wanted of them will be the first three books of A Song of Ice and Fire, donated by George R.R. Martin. Acknowledging that we get donations from all over the world, George has offered the books in whichever language the winner chooses (there are about 40 to choose from). Also on offer are: a fantasy duet from Deborah Kalin which is currently published only in Australia; a hot new release from Small Beer; and a signed Bujold from Baen books. Here is the full list. The fund raiser will end at midnight on the last day of February, because it seemed cool to end on a leap day. Up until that time, everyone who donates money will go into a draw for one of those prizes. The full rules of the draw are available here. Our aim, as with last year, is to raise $2000. As you may recall, we managed $1764.01. Let’s at least beat that. The winner of last year’s Long Form award, A Life on Paper: Stories by Georges-Olivier Châteaureynaud, was published by Small Beer Press. We keep an eye on what they are up to. And this month they have released an exciting new anthology of stories from Mexico. Three Messages and a Warning, edited by Eduardo Jiménez Mayo & Chris. 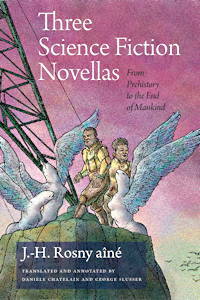 N. Brown, contains more than thirty all-original Mexican science fiction and fantasy. For more information, and biographies of all of the featured writers, see the Small Beer website. Updated January 23rd with lots more prizes. Our jury is now busily considering which of this year’s nominees will receive prizes, but before we can give out those prizes we need money. Our awards are not backed by wealthy sponsors, but by individual contributors and small grants. We have had a kind donation from Science Fiction Studies, and a few from private individuals, but most of our money comes from you, the readers. Huge thanks to everyone who has donated. More prizes may be added during the draw. If anyone would like to donate an additional prize, please get in touch. Our jury has asked us to stop taking nominations for works published in 2011 now. The full list of books they have been asked to consider is therefore as given here. Because translated works are often published in small presses, and our awards are not well known, we don’t always get to hear of eligible works in time. Therefore our rules allow us to carry works over from one year to the next. If you do know of a work that we should have considered from 2011, please do tell us about it. It isn’t too late, we just won’t be considering it for the current set of awards. If you’re a US taxpayer, remember that donations to the SF & F Translation Awards are tax-deductible as charitable donations. We are a recognized 501(c)(3) organization. For most people, if you want to take that tax deduction on your next tax return, you need to donate by the end of 2011. See our Donations Page for further details and how to donate. In 2011, over 95% of our donation income was spent directly on the Awards themselves (award trophies, certificates, and award grants), with less than 5% spent on overhead costs such as postage, shipping, and governmental fees. (A copy of our latest financial statement is available upon request.) This is because all of the work managing the awards is done by volunteers donating their time and effort. You can help us by donating to keep the work going.